Just wondering what people think of the arangement and selection of plants. Please don't feel that I'm being critical, just to be critical, with my suggestions. Everyone sees their garden differently and has their own taste. With that said I would do a few things differently. My first concern is for the trees. 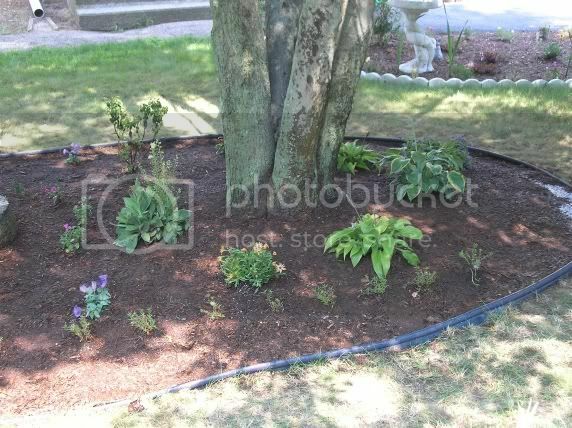 Soil and/or mulch should never be added so the rootflare becomes buried. No more then 2" of soil should be put over existing tree roots. That will stress a tree and can lead to shortening the life of the tree. I would expose the rootflare of the trees. Take a look here. 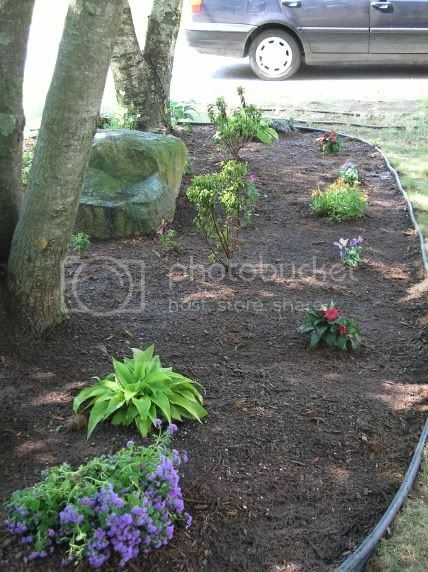 I would move the hostas forward towards the outer edge of the crown or close to the large boulder and maybe add some ferns so the boulder looks more settled into the soil. That way the boulder will look like it was always there and the trees grew up around it. With the bed being so overrun by a root system will the plants survive? I'm more concerned about the trees surviving. If you care for the plants where they are planted the trees will suffer. If you care for the trees then the plants could suffer. They have different watering requirements. 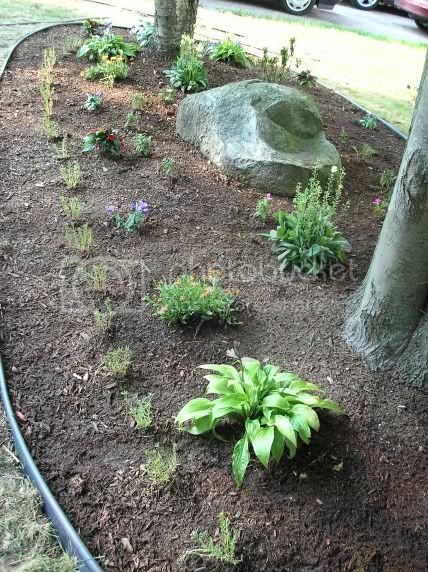 By watering the plants as they need it with the placement they have now, you will be overwatering the trees, especially with the annuals you have that need more water. 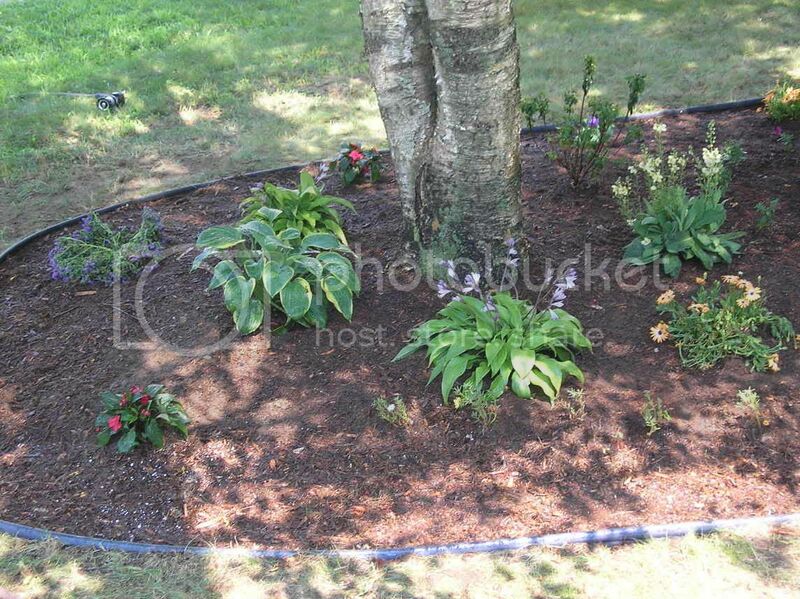 Once the perennials are established in a year they will require less water. Also are there any plants in there that will die due to the winter season around here? This is the only perennial besides the hostas. Verbascum 'Jackie' requires full sun and should be moved to a site with 6 hours or more of sun. Texas Bluebell - Eustoma grandiflorum, Lisianthus is a half hardy annual that might reseed in the right spot. It needs alot of water and full sun of 6 hours or more and should be moved. Lisianthus Russellianus aka Eustoma grandiflorum also an annual but is a very difficult plant to grow from seed so it probably won't reseed itself. It needs full sun to part shade so it could possibly bloom with 4 hours or more of direct sun. It would do much better in full sun. 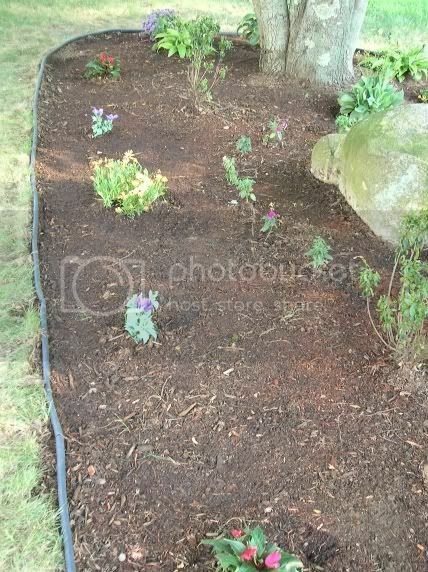 Osteospermum needs full sun and should be moved. Finding a Location for a Jasmine. Help Please~!